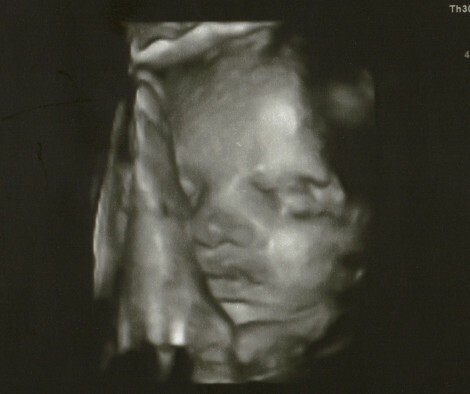 We honestly cannot wait to meet you! You are at 30 weeks now and growing quickly. We had an ultrasound the other day and got to see your adorable little face and fell in love. Your photo is now the first thing I see when I pick up my phone and it makes me smile ever time. You are 4 pounds now and they tell me you could get to 8 pounds if you stay in for the whole time you are supposed to. While I really want to see you soon, you can stay in as long as you need to be healthy. You are rolling around like crazy, and I’m pretty sure you are using my bladder as a trampoline and my ribs as a punching bag. It was cute for awhile. You have a beautiful name but we are being ornery and not telling anyone until you make your grand arrival. It’s just more fun for us that way. Your daddy is already planning outings to the shooting range for you guys. I guess I’m going to have to find tiny ear and eye protection and maybe an all terrain stroller for you. I’m pretty sure you already have him wrapped around your finger even though you haven’t even met yet. You start moving every time I sing on stage. It makes me smile and then I forget my words, but that’s ok. I am going to miss it when you’re not in there. Keep growing strong and healthy, baby boy. This entry was posted on Tuesday, September 25th, 2012 at 2:14 pm	and is filed under Baby Boy, Mandy. You can follow any responses to this entry through the RSS 2.0 feed. Both comments and pings are currently closed.